The linen was clean and the location was excellent. The location was brilliant, overlooking the lovely sandy beach. The staff were very friendly and the rooms were clean. We had breakfast the two mornings we stayed, which was very good. The dining room and bar area had a fantastic sea view. There was an outside patio area which again overlooked the beach. Room was fab. Check in was poor ( whole drama about not having key before 3 even though it was available and room ready. It was our anniversary and since I had mentioned that while booking...they gave a card and some chocolates. Our rooms were clean and comfortable. Staff were pleasant and helpful. Service was good. Breakfasts were very good. There are beautiful views from the hotel and the beaches are very close. The location was absolutely perfect .. we stayed in the superior double room with sea view. The view was amazing! staff were very helpful and friendly. Full and plenty to select for breakfast and all cooked to a very high standard! Delicious!. Thank you all very much. I shall be returning. Great location, fantastic room & view we got upgraded. Spacious, clean and lovely room. Right near the centre of town within walking distance to everything and great access to the beach! Would stay here again! 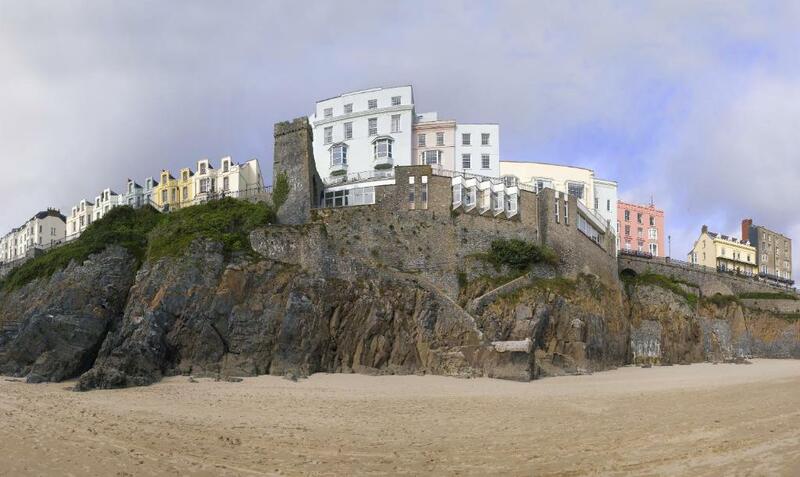 One of our top picks in Tenby.Located only 10 minutes' walk from Tenby Rail Station, the Imperial Hotel offers en suite accommodations, free Wi-Fi, a restaurant and a bar. The property benefits from a stunning cliff top location, boasting views of both Carmarthen Bay and the Pembrokshire coastline. All rooms at the Imperial Hotel provide a TV, tea/coffee making facilities and a desk. Some have a bath with over shower, and some feature a shower. Front facing rooms offer panoramic sea views. Guests can enjoy breakfast and meals in the restaurant, with magnificent views along the beach. The hotel also features a patio terrace and a bar. The property is built into the old stone walls of the old town, and is only 4 minutes' walk from the main street. Tenby Golf Club is found just 12 minutes' walk away. 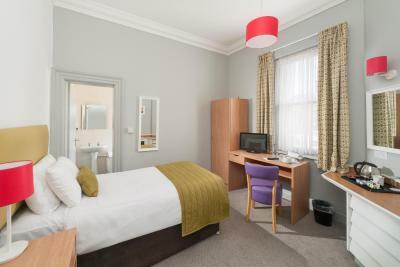 This larger room with attached bathroom offers a TV tea/coffee making facilities, and a desk. A hairdryer is also featured. This room with attached bathroom offers a TV tea/coffee making facilities, and a desk. This twin room features a electric kettle and flat-screen TV. Stairs. Parking is limited at the hotel. Decor tired, silicone sealant above bedroom window, two wall sockets covered over with ”do not use” sign. Restaurant spoiled by windows that don't fit properly, blowing a gale as we had breakfast! When we arrived we were greeted by a very unfriendly receptionist who didn't offer any help with our bags, she could see I was with my 2 elderly parents. The lift was only big enough for 2 people so I had to do several trips with my luggage. The decor of the hotel was appalling, paint peeling off the walls, doors to the bedrooms were filthy as of most of the doors, the windows in the bedrooms were covered in mildew and 2 panes of glass in my bedroom had cracks in them, I had to run around in the shower to get wet, there was no water pressure!! The breakfast was very poor on our first morning there was hardly anything left I had to ask for it to be replenished. The seating next to the dinning area was filthy, as it is the beginning of the holiday season I find it quite unbelievable!! The outside of the hotel needs a complete revamp!! There was a problem with the drainage from the shower and bath, which were blocked and caused a nasty smell. The room and location was great. The restaurant was not! Possibly staffing change over/issues. Dinner was cold and some dishes inedible particularly compared to the price. We were not satisfied at all. Stay in the hotel but eat elsewhere. Poor attention to detail on rooms and general lack of maintenance. Poor Breakfast, burnt and over cooked.